Over the years Archie has welcomed more than its share of bizarre crossovers, from Archie Vs. Sharknado to Archie Vs. Predator and the classic Archie Meets The Punisher. But now Riverdale’s wacky teenagers will soon be embarking on their most bizarre crossover adventure yet. Actually, by “most bizarre,” we actually mean “least bizarre,” because this one seems pretty straightforward when compared to Archie Meets The Punisher. 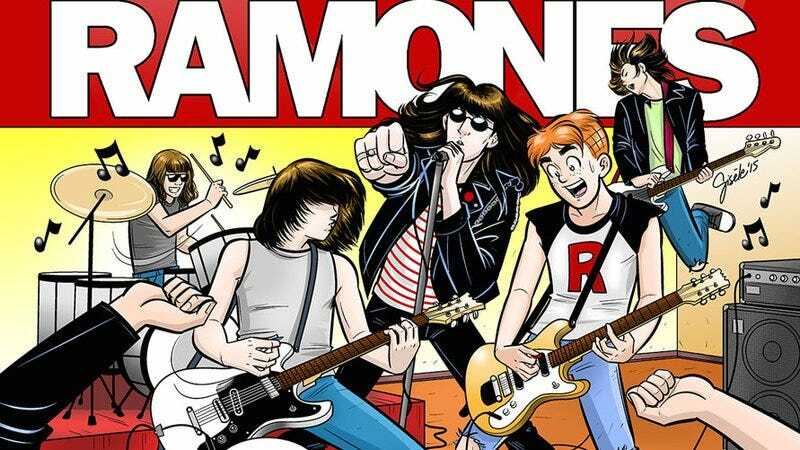 Anyway, Comics Alliance is reporting that Archie and his friends will be meeting legendary punk band The Ramones next year in an oversized one-shot comic that is appropriately named Archie Meets Ramones. (No “the,” though, so maybe Archie is only meeting some of the Ramones.) The comic was created by Alex Segura, Matthew Rosenberg, and Gisele Lagace, and it’ll be published at some point next year to tie in with Archie’s 75th anniversary and the Ramones’ 40th anniversary. Also, based on the cover art, it looks like this might be set in the traditional, Pre-Crisis Archie universe, and not Mark Waid and Fiona Staples’ Archie reboot universe.